Not counting that weird two-inning spot start by Chad Green that gave everyone an extra day of rest, the Yankees made it all the way until mid-June before needing a sixth starter last season. 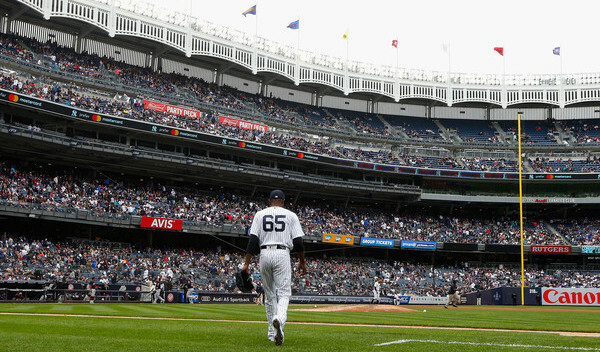 A minor left hamstring issue sent CC Sabathia to the disabled list for two weeks. His replacement, Luis Cessa, made his first start on June 18th, in the team’s 67th game of the season. Going that long without needing a sixth starter is pretty good! Who knew German finished fifth on the Yankees in innings? He made 14 starts and seven relief appearances and finished with a 5.57 ERA (4.39 FIP) and a very good strikeout rate (27.2%), a good walk rate (8.8%), and a not good ground ball rate (37.4%). Like seemingly everyone else, German was much better as a reliever (3.12 ERA and 3.22 FIP) than as a starter (6.19 ERA and 4.68 FIP). A very good start to German’s stint in the rotation quickly gave way to inconsistency and a trip to the minors, and, eventually, the disabled list. German missed most of the second half with a nerve issue in his elbow before resurfacing as a seldom-used September call-up. Let’s review Little Sunday’s season. German replaced Montgomery in that May 1st game and threw four scoreless innings against the Astros. It was impressive. Five days later he made his first big league start and struck out nine in six no-hit innings against the Indians while being held to a pitch count (he worked out of the bullpen in previous weeks). This was the “wow the Yankees might really have something here” moment.
? German’s first start was incredible. Things went downhill after that. Next time out the Athletics tagged him for six run in five innings. In his next start after that, German gave up six runs in 3.2 innings to the Rangers. Following that stellar first start, German allowed at least four runs in each of his next four starts. He finished the year with more starts with 6+ runs allowed (four) than starts with fewer than three runs allowed (three). The ERA is still high after the first inning, for sure, but a little more help from the bullpen stranding runners would’ve been nice, plus everything else is much better. The batting lines do not compare and neither do the home run rates (2.57 HR/9 vs. 1.49 HR/9). That first inning of the game, the only inning in which a team is guaranteed to send their best hitters to the plate, was a big problem for German. I wrote about using an opener for German once and mentioned it several more times. Getting German away from the top of the other team’s lineup the first time through the order seemed worthwhile. The Yankees could’ve used Jonathan Holder or Chad Green or David Robertson to open before giving the ball to German for innings two through whatever. Hopefully six, but even five would’ve sufficed. The Yankees never did that and German’s first inning woes against the other team’s best hitters put New York down early in half his starts. Harrumph. Go watch that video of German’s start against the Indians again. This dude’s stuff is super legit. He’s got a mid-90s heater with some run, a snappy breaking ball that dives out of the zone, and a hard changeup with big time fade. Nothing the guy throws is straight and I suspect at least part of his command trouble stems from the liveliness of his stuff. When your pitches move like that, it can be hard to locate them. There are two negatives in that table. One, German’s fastball and curveball ground ball rates are comfortably below-average. That doesn’t mean they’ll be below-average forever. They could improve with experience and natural development. In 2018 though, they were below-average. And two, German’s changeup spin rate is too high. You want a low spin rate on the changeup so it tumbles down and out of the zone. His spun too much this year. Aside from that, man does it look good. Excellent velocity and comfortably above-average whiff-per-swing rates across the board. German’s fastball spin rate is very good. It’s right up there with Aroldis Chapman (2,499 rpm), Max Scherzer (2,486 rpm), and Corey Knebel (2,477 rpm). There is much more to life than velocity and spin rate, believe me, but you can’t fake it. Either you can throw the ball hard and make it spin, or you can’t. German can. There’s a chance German will fall by the wayside like countless other great stuff/bad command pitchers. It happens. A lot. In German’s case, I can’t help but watch him and want to believe. The stuff is so good. This guy was a former top prospect with the Marlins, remember. Can German ever get over the hump and turn his impressive stuff into consistent MLB success? We’ve seen flashes, but it hasn’t happened yet. The Yankees and German have reached a crossroads. He is now out of minor league options, meaning he can’t be sent to the minors without clearing waivers, and I see little chance of that happening. German is young enough (26) and his stuff is good enough that he’d get claimed, I think. Some rebuilding team would take a chance on him given the essentially free acquisition cost. I sure would. One of three things will happen with German this offseason. One, he’ll stick with the Yankees and compete for a job in Spring Training. Two, they’ll trade him. Maybe as part of a larger package, maybe in a minor trade, or maybe as a way to unload salary a la Bryan Mitchell in the Chase Headley trade last winter. Or three, the Yankees will designate German for assignment to clear a 40-man roster spot and (probably) lose him on waivers. I’d say sticking with the Yankees is most likely, followed by a trade. I can’t see them giving German away for nothing on waivers. Not yet, anyway. Maybe things’ll change at midseason next year. Right now, I think he sticks or gets traded. I would really like to see German in a one inning “air it out” relief role. His command stinks, but you can hide bad command in the bullpen. Maybe German could out-stuff hitters a la Betances and Chapman as a reliever? I hope we get a chance to find out next season.